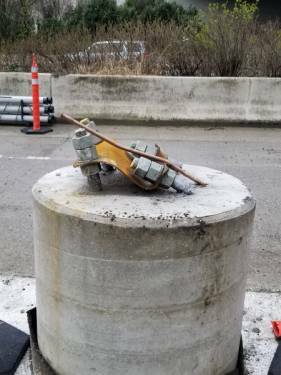 The anchor rods in this photo were damaged because they were covered with snow and the equipment operator did not see them. So field bending F1554G36 is acceptable as long as it is not more than 45°, and is it done per the parameters in the above paragraph. For other grades of anchor, or if the bend is more than 45°, the project engineer should be consulted in order to make the proper decision. @Alagar- You will have to consult the MTRs for the bolts to see if their chemical composition is in line with weldable material. We have casted in concrete M36 SS304 bolt. During installation, it was hit accidently by a cutter plate and it cut through the thread hence damaging the threaded area of the bolt. the length of thread damage is more than the depth of thread in its mating nut. Is it possible to deposit material on the damaged area to built back the bolt and subsequently thread it back to the spec required. Is it allowed by any code. @Usaid- We are not aware of any code that allows weld repair for this kind of situation, in fact it is usually prohibited. Replacing the bolt would be a safer option. Thanks sir for your prompt reply. Considering the amount of rework required as the bolt are embedded 1.5m into the concrete. We are studying option if any which is allowed by any code to reuse back the damage bolt. So far i have not found any code which allows that as such made me to ask an expert such as portlandbolt. F1554-55-2″ Anchor Rods being heated to 800F-1100F and rapidly cooled over and over. Is this a cause for concern? @David- Normally we are not too concerned with heating F1554g55 rods during manufacture, however multiple heating and cooling cycles may affect the steel in ways we are not familiar with. You would need to contact an engineer of metallurgist to be certain. @Loilest- It depends on how badly damaged the zinc coating is. If it is minor, it can be touched up with cold galvanizing spray. If the damage is more extensive, you will need to have the bolts stripped and re-galvanized. We have installed stainless steel 304 anchor bolts (installed in concrete, cast in place) and they have to have verticality deviation no more than 1mm (measured on top). Some of them need to be bent just a few milimiters (less than 5°). Can we cold bend these anchor bolts considering ASTM F1554? Size of our anchor bolts are 30mm diameter. @Octavio- We do not have any guidelines for bending stainless anchor bolts in the field. Our guess is that a minor bend like you describe would not adversely affect the bolt, but the project engineer should be consulted for approval. can be a A36 anchor bolt is bend at about 80 dgree it can be repair? @Amin- Per AISC guidelines, anything over 45deg is too far to be bent back, so an alternative method of repair would be needed. @John- The AISC guidelines only allow for the bending of G36 in the field. I do not see any huge issues with bending the way you describe, but you would need to consult with the project engineer in order to get his or her approval. we fixed Anchor bolts Dia of 24 mm in Concreate. Anchor bolts thread length already have 100 mm.now we increase the thread length about 160 mm. kindly give me suggestion what machine of thread we use or any technich. @Barkat- You may be able to use a die nut, but you will need to contact a tool and die shop to see what your options are. We don’t really have any experience with adding thread in the field. @Dharmendra- There are many reasons why an anchor bolt can fail – anything from a bad bolt to improper installation to incorrect engineering. We are unable to pinpoint a reason for your failure without knowing all the information. can be a SA307-A anchor bolt is bend at about 30 dgree it can be repair? @Ronelson- Typically speaking, A307A is made from a similar material as F1554G36. Therefore I would think that you could carefully bend your anchor bolt back into place. Heat can be applied to the bolt to help, being careful to not exceed the 1200F limit set by the AISC. if already installed anchor bolt broken, and also already installed steel structure column. then how we can rectify. @Anil – Depending on where it broke, and how many threads are left, you could possibly add a coupler and all thread rod, or perhaps a hole could be drilled and an anchor epoxied into place? It is hard to give a specific recommendation without specifics of the anchor.